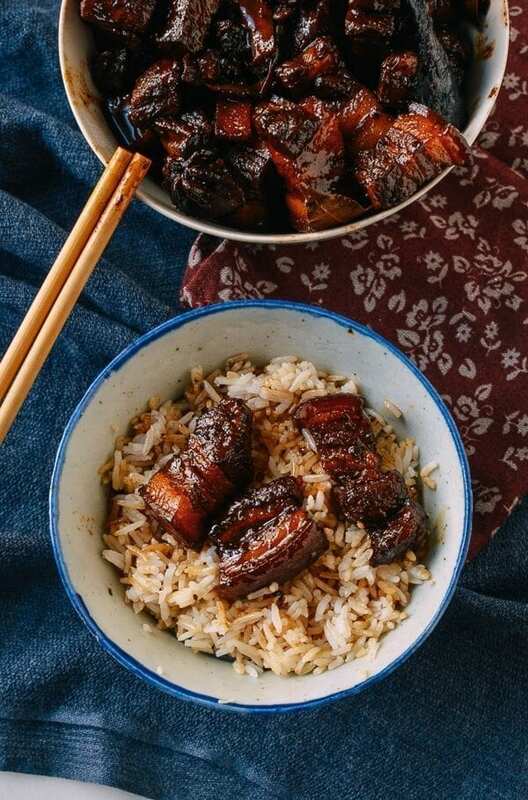 Today, I’m sharing a recipe for Chairman Mao’s Red Braised Pork Belly. 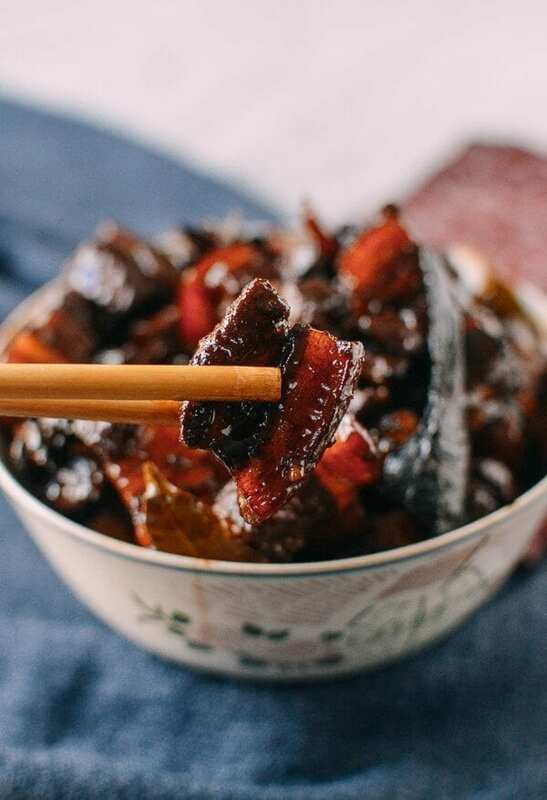 While the recipe for Shanghai Braised Pork Belly is admired by many, I think it’s time to expand upon it. 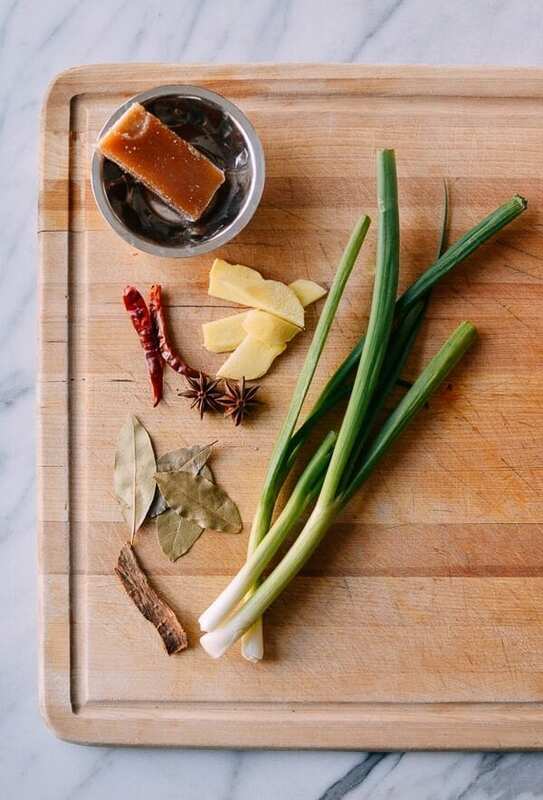 Many of you have inquired about adding aromatics like scallions, ginger, garlic, and spices like star anise. I resisted a bit, because I really like the traditional flavors of Shanghai-style pork belly. 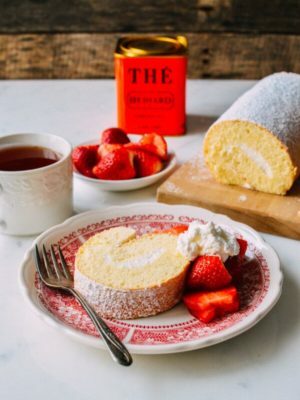 It’s like vanilla ice cream––understated, but it really hits the spot. 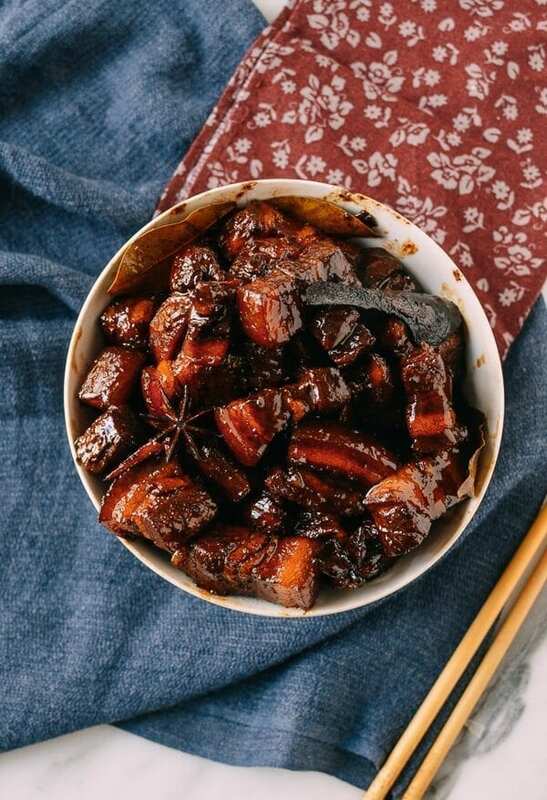 Chairman Mao’s Red Braised Pork Belly is kind of like the rocky road to Shanghai-style Pork Belly’s vanilla. 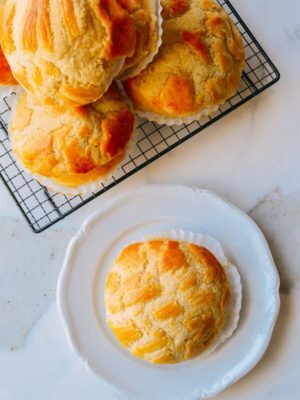 I personally like everything original: vanilla ice cream, old-fashioned donuts––they’re familiar and comforting. But sometimes, a little rocky road is needed. Overall though, Chinese people love their braised pork belly. 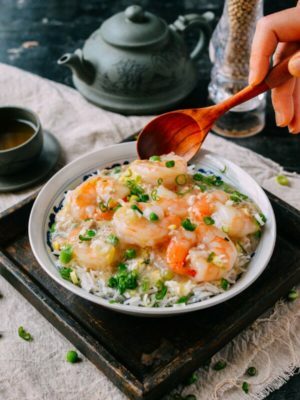 It’s a very popular dish, but depending on where you’re traveling in China, the taste can vary drastically from city to city, and from one kitchen to another. 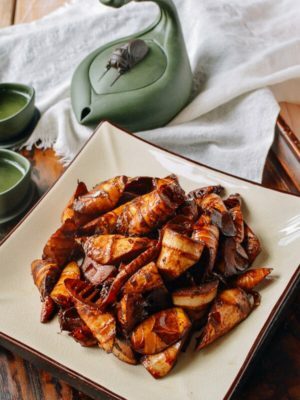 In Shanghai, the taste of the dish is pure, dark soy sauce. 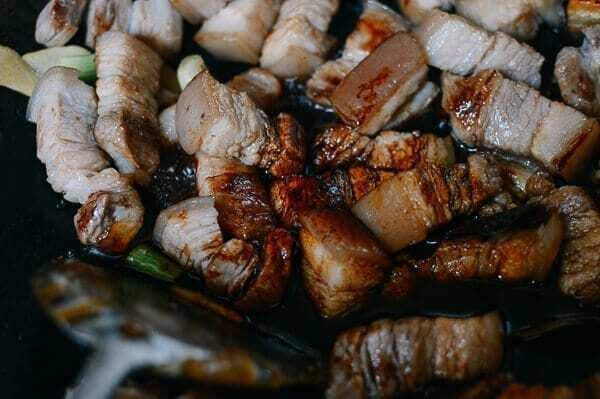 In Wuxi, an hour and a half drive away, the braised pork belly tastes closer to candy in sweetness. 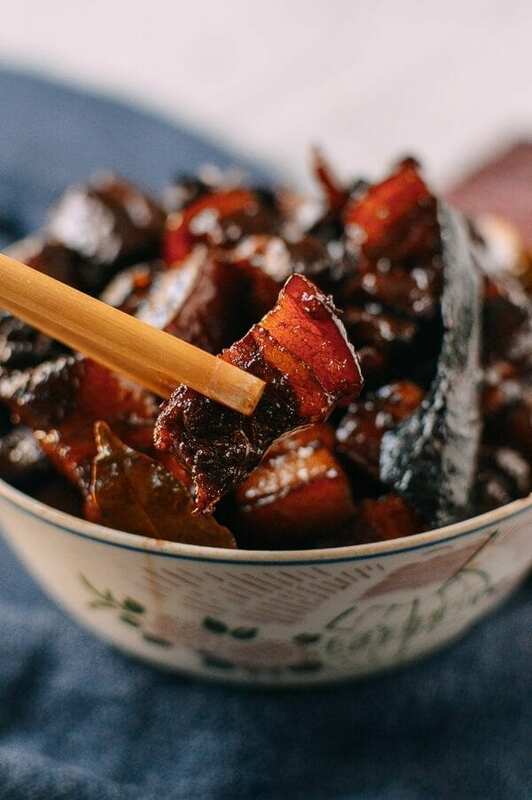 And if you hop on a plane to Hunan, you’ll find Chairman Mao’s Red Braised Pork Belly. 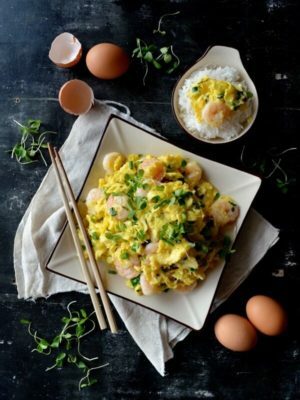 The dish is more heavily flavored with spices, as every meal there requires the addition of chili peppers. 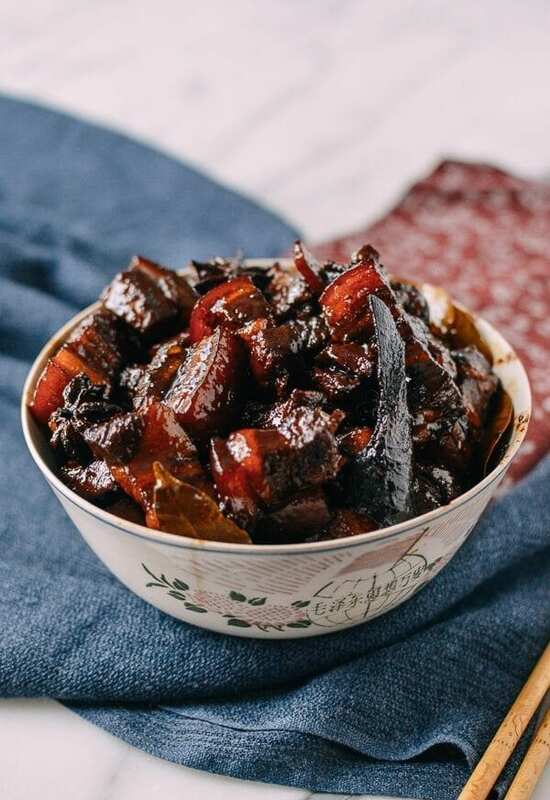 Even in Hunan, there are many variations of Chairman Mao’s Red Braised Pork Belly. 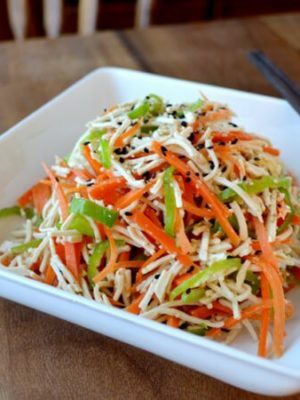 Soy sauce vs. no soy sauce; more aromatics vs. less aromatics; some recipes even ask for hoisin sauce. 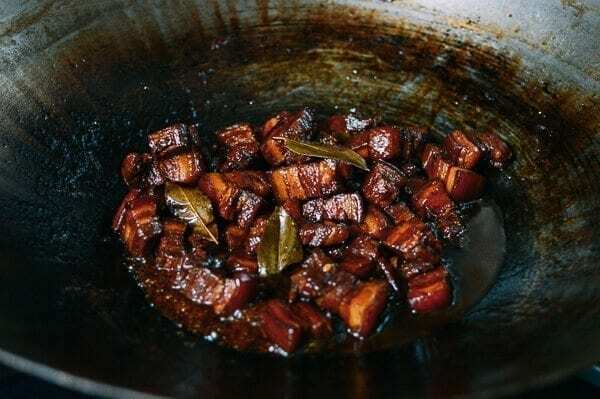 But there are two common themes: caramelize the sugar like you would in Shanghai Braised Pork Belly to add color, richness, and sheen. 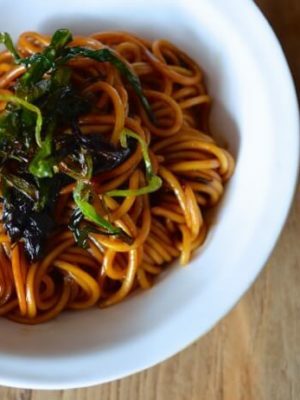 Add the dry hot chili peppers, which are critical to Hunan cuisine. But feel free to experiment. You really can’t go wrong with braised pork belly! For the dry hot chilis, the longer you cook them, the hotter they get. 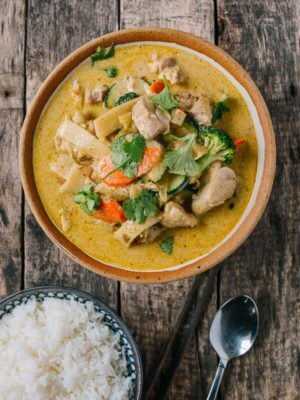 You can omit or remove them halfway through cooking if the dish gets too spicy. 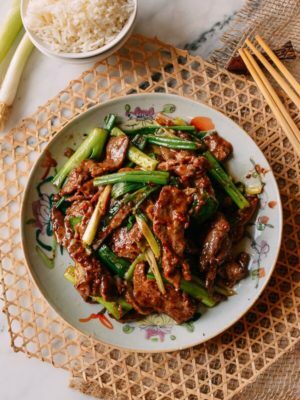 New discovery in my pork braising experience––adding ½ teaspoon sugar at the end rounds out the stronger flavors of the soy sauce and the spiciness from the dried chilies. Give it a try, and let me know what you think! 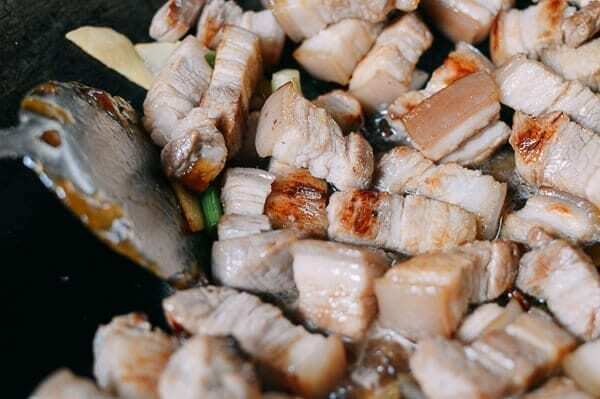 The first step is to blanch the pork belly, which removes any blood or impurities from the meat. 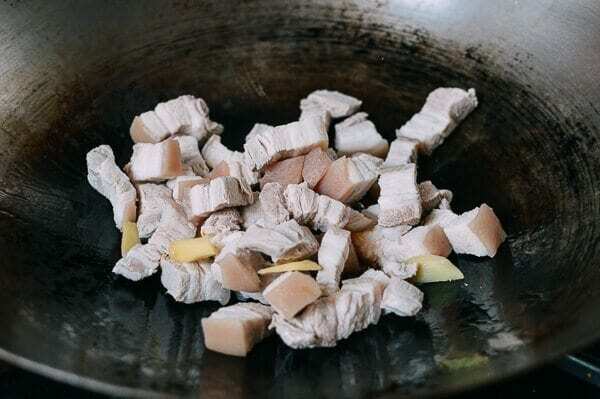 To do this, add the pork belly and 3 slices of ginger to a pot with enough cold water to submerge the pork belly. With the lid on, bring it to a boil. Once the pot boils, turn down the heat and simmer for one more minute. Drain, rinse the pork belly clean, and set aside. 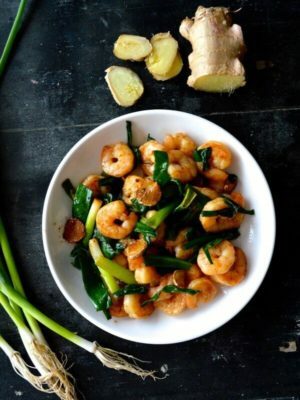 With the wok set over low heat, add the oil and rock sugar (or 3 tablespoons regular sugar). Slowly melt the sugar, taking care to not let it burn. Then add in the pork belly, 3 slices ginger, and the white parts of the scallions. Turn up the heat to medium. Stir and coat the pork belly with the melted sugar. 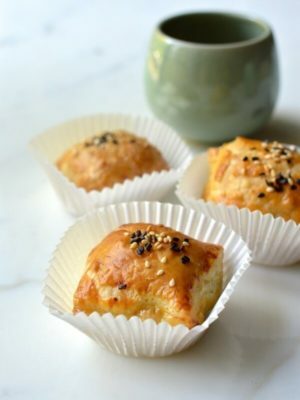 Now, add the Shaoxing wine, light soy sauce, dark soy sauce, cinnamon, star anise, bay leaves, dried chili pepper, and water. Stir and make sure everything is submerged. 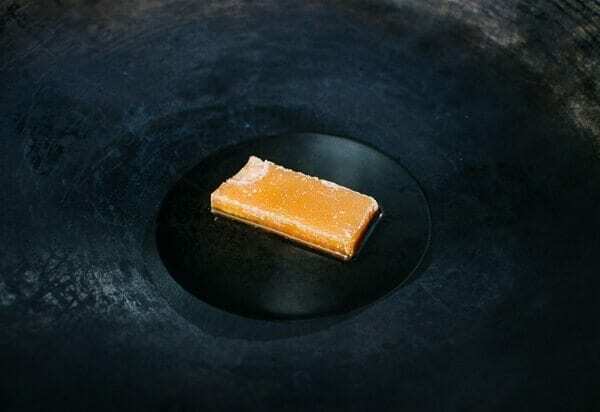 There will be some caramelized sugar on your spatula, dissolve it in the water before covering the wok. Bring the mixture up to a simmer over medium low heat for 1 hour. Check the pork periodically to make sure the sauce doesn’t dry up. 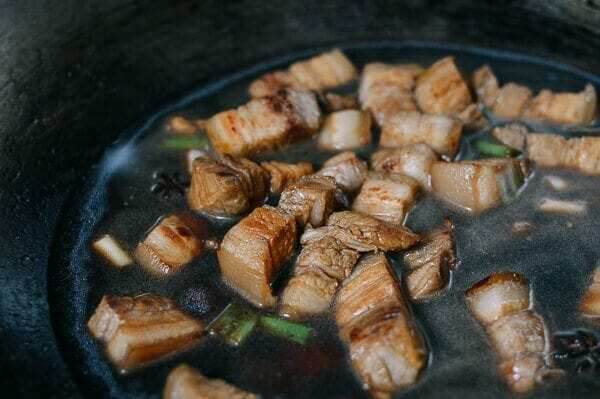 Once the pork is to your liking in terms of tenderness, turn up the heat to cook off any excess sauce, stirring constantly. The sauce will reduce to a glistening coating on the pork belly. Last, add in the remaining ½ teaspoon sugar and the green parts of the scallions. 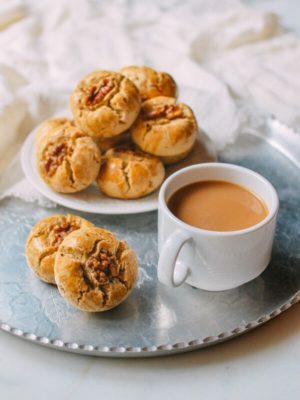 Stir quickly and serve! 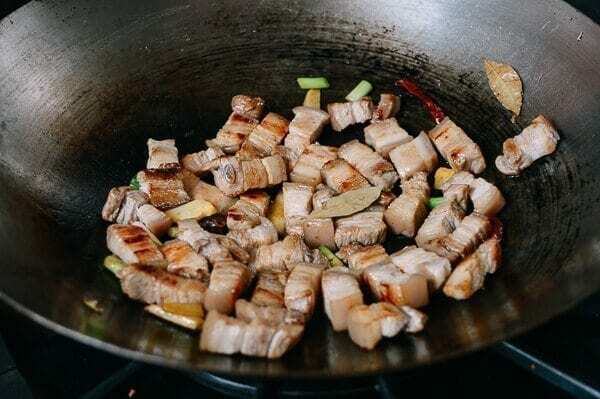 Chairman Mao’s Red Braised Pork Belly is a famous Chinese dish with many slight variations. 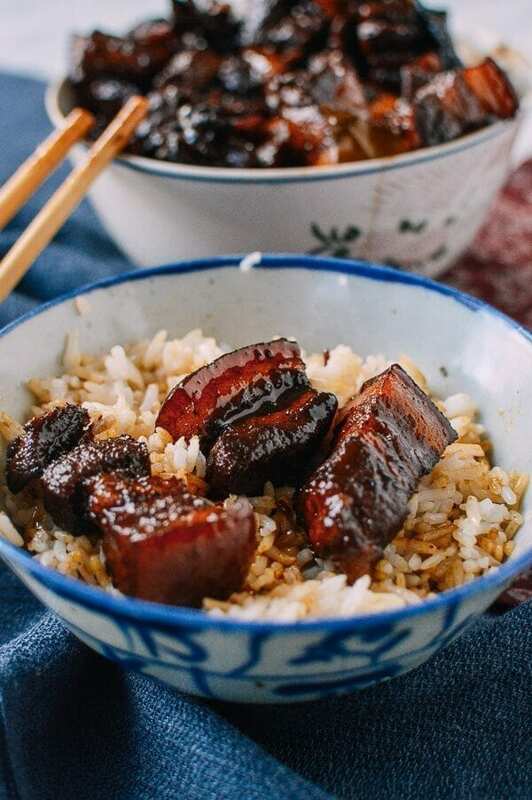 This recipe involves caramelized sugar, spices, and soy sauce, to create an incredibly flavorful pork belly that you'll want to make again and again. 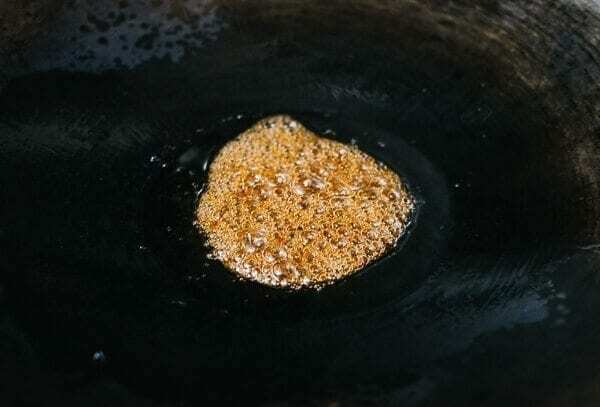 With the wok set over low heat, add the oil and rock sugar (or 3 tablespoons regular sugar). Slowly melt the sugar, taking care to not let it burn. Then add in the pork belly, 3 slices ginger, and the white parts of the scallions. Turn up the heat to medium. Stir and coat the pork belly with the melted sugar. Now, add the Shaoxing wine, light soy sauce, dark soy sauce, cinnamon, star anise, bay leaves, dried chili pepper, and water. Stir and make sure everything is submerged. There will be some caramelized sugar on your spatula, dissolve it in the water before covering the wok. Bring the mixture up to a simmer over medium low heat for 1 hour. Check the pork periodically to make sure the sauce doesn’t dry up. 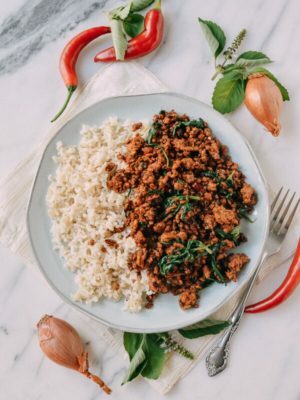 Once the pork is to your liking in terms of tenderness, turn up the heat to cook off any excess sauce, stirring constantly. The sauce will reduce to a glistening coating on the pork belly. Last, add in the remaining ½ teaspoon sugar and the green parts of the scallions. 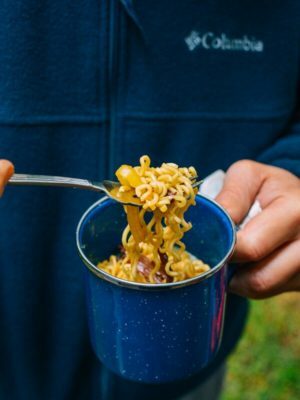 Stir quickly and serve! Can I make this a day ahead and reheat? 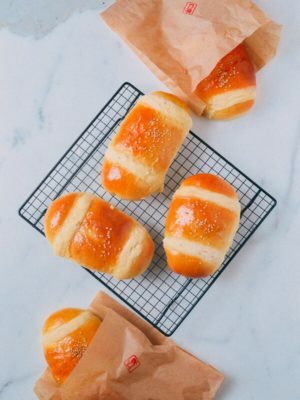 Will it taste as good? Hi Anna, you can cook it until it’s 80% done and finish cooking it before serving. 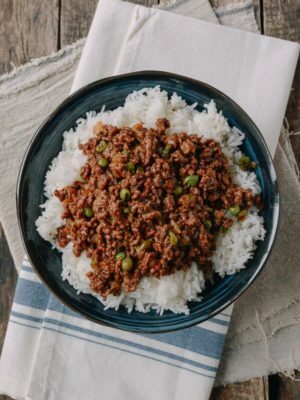 I tried this recipe yesterday, and even though it was great I didn’t get the sauce to really glaze the meat – it just reduced down and then was gone. Do you know where I might have made a mistake? 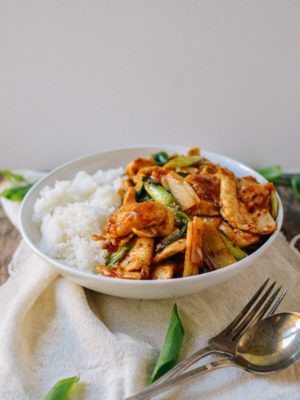 I added the Shaoxing wine, light soy sauce, dark soy sauce, cinnamon, star anise, bay leaves and dried chili pepper at the same time as I added the water. 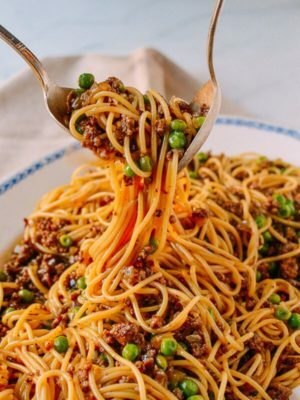 could that have inhibited the sauce from properly coating the meat? 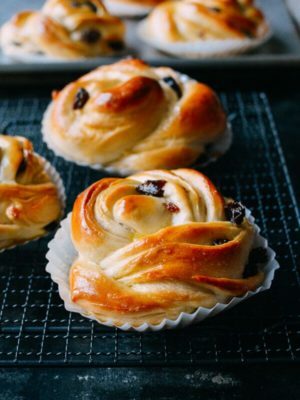 Still a wonderful recipe I will definitely make again! Hi Yasmin, is your pork (belly) really lean? a lot of the glaze comes from the pork fat.